Toms® products are particularly the rage these days because of the company’s awesome one-for-one policy. For each pair of Toms® shoes a customer buys, the company will provide help to people in the need. In the beginning, they just donated shoes, but now the company has expanded to help improve access to water, safe birthing environments and sight for those in need. It’s a great cause and generally makes people feel great about buying Toms® products, but none of that helps you figure out how to wash those great shoes you bought. Not to worry. We’ve got you covered. Can You Put Toms® Shoes in the Dryer? The company recommends hand-washing over machine washing because hand-washing is easier on the shoes and will extend the shoes’ life. 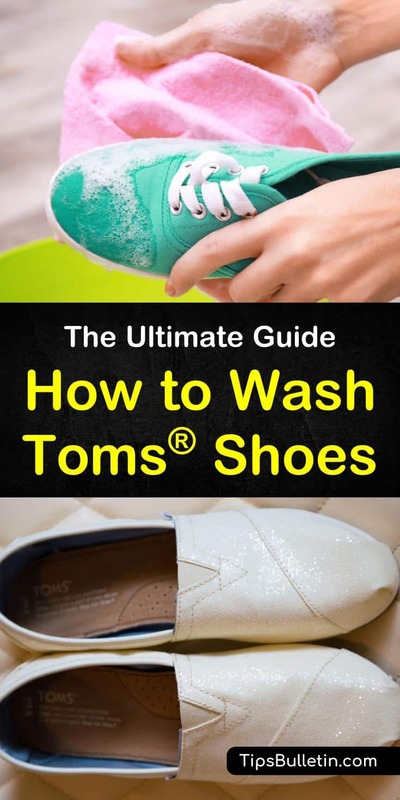 Although the Toms® company would have you believe otherwise, you can wash the shoes in the washing machine, but you want to do a little more than just toss them in and hope for the best. You can also clean white Vans® this way. Whether you wash shoes by hand or use a washing machine, be sure to remove the laces first. Those should be cleaned separately. First, use your brush to remove any clumps of dirt. Brush over the whole shoe to ensure any surface dirt is gone. Next, you will want to mix the soap and water in the bowl. Then, wet your brush and scrub the outside of your shoe until you have removed all the dirt. For the easiest grip, put your other hand inside the shoe. Allow the shoe to air dry. The best place to air dry your shoes is in a sunny location. You’ll want to remove clumps and other surface dirt using a soft bristle brush even if you are washing sneakers in the machine. If there are stains on the shoes (rather than just all over dirt), you can use a pre-wash treatment on the stains to help remove them. Then, set your machine to the gentlest cycle it has and fill it up with cold water until it is half full. Afterward, add a small amount of the gentlest detergent you can find. Allow the machine to fill three-quarters of the way before adding the shoes. Let the cycle run to completion. Remove the shoes when the washing machine is done and air dry. If you’ve had a pair of Toms® for a while, you have probably noticed they tend to begin to get increasingly smelly as their life goes on. The good news is you don’t need fancy deodorizers to remove the smell from your Toms®. To get odor out of shoes, wrap some baking soda or baby powder in a cloth (tie it to keep the baking soda from spilling) and place in your shoes. Make sure you put the baking soda in a cloth and not straight into the shoes because direct contact with baking soda will eventually crack and ruin the insoles. Additionally, applying small amounts of tea tree oil to the inside of the shoe on a regular basis can help reduce and prevent odors, as well as help prevent fungus formation. Always remove the laces before you start hand or machine washing. The laces can be washed and dried like normal clothes. Avoid putting your shoes near any direct heat source when drying, like an oven or heating vent. Always use a mild detergent when washing by hand or by machine. Put paper inside your shoes while they dry to help them retain their shape. You can dip the canvas part of the shoe in water to aid in hand-cleaning, but do not completely submerge the shoes in water when cleaning by hand. Although you can machine wash your Toms®, you should not machine dry them. Never put Toms® (or any type of canvas shoe) in the dryer. The direct heat from the dryer can adversely affect the glue that holds the soles on the shoes, making the sole peel away from the shoe and greatly reducing the life of your Toms®.